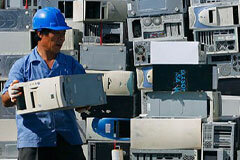 Sustainable business models key to waste reduction. Geneva, 2 April 2013 – Representatives of Central American governments, private companies, universities and non-governmental organizations have agreed on a 20-point Agenda aiming to promote advances in the handling of waste electrical and electronic equipment (WEEE or ”e-waste”) in the region. Key will be the application and identification of business models that leverage recycling opportunities and create new employment. The new Agenda was agreed by the 86 participants in the ITU/UNEP Workshop for Capacity Building on Environmentally Responsible Management of Waste Electrical and Electronic Equipment (WEEE), organized in San Salvador, March 19-21 with the support of ITU Sector Member Telefónica. The Agenda emphasizes increased collaboration between all parties, as well as the development of online learning programmes and workshops aimed at policy-makers. It calls on ITU and UNEP/PACE to assist Central America and the Caribbean in the development of regulations, legislation and international standards to mitigate e-waste’s potentially damaging effects on the environment and the health of local populations. Electronic devices can contain up to 60 different chemical elements. But deficiencies in collection methods, recycling technologies and illegal dumping mean the majority of these valuable resources are lost when equipment reaches end-of-life. The failure to close the loop on e-waste leads not only to adverse environmental impacts, but also to the depletion of a potentially valuable resource base of ‘secondary equipment’. Workshop participants reaffirmed their commitment to the implementation of the Basel, Rotterdam, and Stockholm Conventions, while also recognizing the importance of ITU Resolution 79 on “The role of telecommunications / information and communication technology in handling and controlling e-waste from telecommunication and information technology equipment and methods of treating it” adopted by the World Telecommunication Standardization Assembly (Dubai, 2012). This resolution urges ITU to develop activities related to capacity building and the implementation of recommendations, methodologies and other publications on the responsible management of e-waste. “The Central American Commission on Environment and Development (CCAD) is very thankful for this important contribution and happily offers to promote this Agenda and its model of cross-cutting integration of efforts amongst environment, health and telecommunication authorities, private sector and civil society,” said Mr. Nelson Trejo, Executive Secretary of CCAD, at the inauguration of the workshop. “If we tap into the potential of wide public-private sector partnerships to promote environmentally sound management of WEEE, we will be able to create a vibrant green economy, while reducing poverty, health hazards and risks, climate change and the pressure on our non-renewable resource base,” said Mr. Miguel Araujo, Director of the Basel Convention Regional Center for Central America and Mexico (BCRC-CAM). The Workshop for Capacity Building on Environmentally Responsible Management of Waste Electrical and Electronic Equipment was jointly organized by the International Telecommunication Union (ITU); the Secretariat of the Basel Convention administered by the United Nations Environment Programme (UNEP), through the Basel Convention Regional Center for Central America and Mexico (BCRC-CAM); in cooperation with the Partnership for Action on Computing Equipment (PACE) established under the Basel Convention on the Control of Transboundary Movements of Hazardous Wastes and their Disposal; the Central American Commission for Environment and Development (CCAD); and the Ministry of Environment and Natural Resources of El Salvador (MARN).